How was your weekend? Mine consisted of Schweddy Balls. Umm…what? Yes, Schweddy Balls. It is a Ben & Jerry’s ice cream flavor. What did you think I was talking about? It’s based off of the Saturday Night Live skit “Schweddy Balls.” Have you seen it? It’s a classic. I could go on, but I won’t. You are welcome. We got two flavors, Clusterfluff and Schweddy Balls. I was a little nervous about the rum flavor, but it was really good. I would highly recommend it. If you try it, let me know how you like Schweddy Balls. Ok, I’m done making jokes about the name. My sister’s bachelorette party was this past weekend. We went for a hike and then worked up an appetite, so we stopped at So Fun! 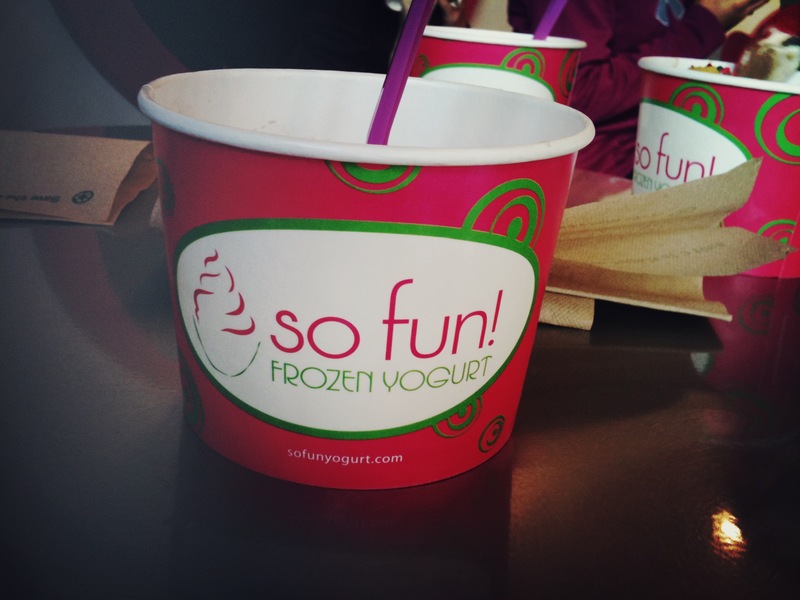 Frozen Yogurt. They have a million flavors of frozen yogurt to choose from (that might be a slight exaggeration.) So what you do is, go in, get a cup, fill it with whatever flavors you want and then choose your toppings. You can get as much or as little as you want. The price is based on the weight. It was delicious. And, the frozen yogurt is healthy, so my sister will still be able to fit into her wedding dress. My older sister was really hungry. I have no idea what all is in there. …what my roommate made. Ok, you probably will. It isn’t that hard to figure out. Actually it is quite common to make in the summer. And it is DELICIOUS. Especially when it is in my favorite flavor. Yummy! Here’s the recipe. Evidently, it is easy to make (and you don’t need an ice cream maker), but I can’t confirm that, since I never made it.